Swishing and Swiping our bathrooms is how we keep them clean. Many of us have company coming for Thanksgiving next week. Swishing and Swiping is so easy to do when you start with a clean and shiny bathroom. I am going to help you get your bathroom looking beautiful! Similar to Crisis Cleaning your home to get ready for company; I am going to show you how to clean your bathroom. Gather up all the towels and toss them in the washing machine. Grab a garbage bag, a give away box, and a put away box. If you have a small basket that could be used for your makeup; grab it. Take all the bottles of shampoo, body wash, bubble bath, and other stuff and put in a box. Throw away empty bottles. Grab a vase from under your kitchen sink. Empty the small amount of shampoo from bottles by adding a like amount of water. This will become a holder for your toilet bowl brush. If you have little children combine them all into a squirt bottle. Then all you have to do is squirt a little into the toilet. Wipe down the edges of the tub. Scrub the bathtub. This can be done with your FlyLady Mop, purple rag, or your Rubba Scrubba. Keep in mind that the bathtub ring is made of soap and dirt. The same soap you put on your body will clean this film. If you have a shower curtain that is moldy then throw it away or put it in the washer with the towels. The towels will help to scrub it. Don’t dry it! I have a $2.00 fabric one that dries. As for your shower doors and walls; the film that is on them may be too much to do as you are crisis cleaning. It is the same soap that is on your body. If you will keep a purple rag in your shower, over the next few days you can scrub one area while you are waiting for the conditioner to work on your hair. After a week the doors will be clean. If you don’t believe me that the film is soap then, take a clean wet purple rag and start rubbing it. Before you know it; you will have a lather. Spray with some soapy water around the back and the base of your toilet and let it set while you clean the inside of the toilet. This will make it easier to clean. Time to dig out your rubber gloves! Put them on. If your water is hard like mine then you have a calcium deposit around rim of the toilet. Go grab an old one that is under your kitchen sink. You are going to throw this away after you use it. I took a 3M scrubber and some Comet Cleanser (use what you like or baking soda and vinegar), and get in there and attack this nasty toilet. You can feel the crustiness if you get in there with your hands clad in rubber gloves. Then toss that nasty scrubber and the gloves. NOTE: If you can’t scrub the calcium deposits away you may have to take an old butter knife and chisel away at it. It usually pops right off. I have had to do this too. Now take a purple rag and wipe up the water around the base of the toilet. Take a clean cloth and wipe down the top of the toilet, sides, seat, and the rim of the toilet. While you are there check the walls to see if they need wiped down too. Sometimes there are splatters on the wall, especially if you have little boys. It time to clear off the top of your vanity. We usually have way too much stuff on our counter. We have to make room in the vanity for your makeup and daily facial routine. Box up everything that is on the counter. You are going to need a trash bag too. Now open a drawer and clean it out. Toss away the trash. Only keep what you use. Wipe out the drawer. Then put back the essential items. Put your makeup in a basket that will be easy to access. Yes, we are going into the bottom of the vanity. Get rid of any cleaning stuff that you don’t use. This is where you are going to keep your makeup basket. When you use it; you have a place to put it away. Get tough! You can also keep extra towels and wash cloths under here. Think about being at a hotel. This is where they keep those extra towels. The only cleaner you will need is your favorite window cleaner. Go through the boxes and dump all the trash and recycle what you can. Empty the trash can and put in a new bag. Grab your mop and rubba sweepa. If you use hairspray you may need to scrub the bathroom floor. Keep in mind that soap is soap. Put a little water and some soap on the floor and scrub with your sweepa. I like to use old towels to get up the dirty water. Put down some more water and use your mop. You probably will not need any soap because you have gotten up the worst part. Put your shower curtain back up or replace it. Wipe the mirror of those dental floss home runs. Wipe the counters and the sink! Wipe the light switches. Get all the bags and boxes out of the bathroom. Put the makeup basket under the sink. Now stand back and look at your beautiful bathroom. I am so proud of you for tackling this one room that can make you nuts. With it clean and shiny, a simple swish and swipe daily will keep it looking beautiful. 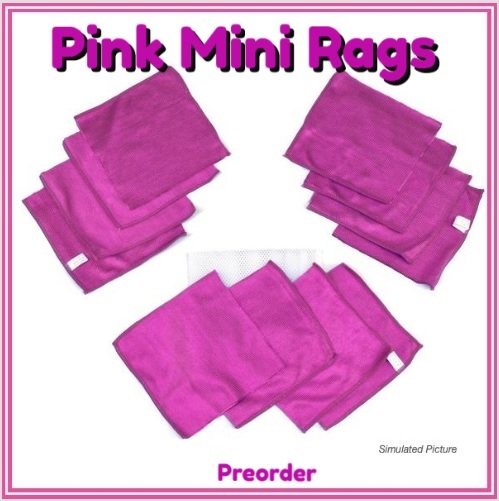 Have you seen our newest tool in the FlyShop; it is mini Hot Pink Rags. They are great for removing makeup and cleaning your eye glasses. Since they are hot pink you will find them easily in your purse. Save $75.00 on our Complete Cleaning System! You don’t even need a coupon code to take advantage of these savings for Purple Rags and Swish and swipe Pack. This entry was posted in Morning Musing and tagged bathroom, crisis clean, flylady, Purple Rags, shower curtains, swish and swipe, toilet. Bookmark the permalink.